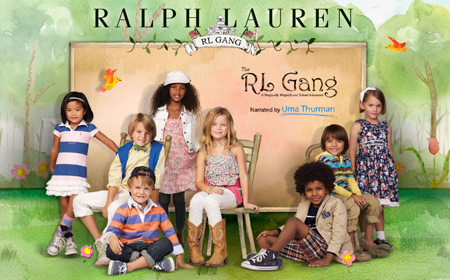 This spring, Polo Ralph Lauren expands its shoppable children’s online storybook collection with the introduction of ‘The RL Gang: A Magically Magnificent School Adventure.’ Showcasing Ralph Lauren Childrenswear Spring 2011 collection, the new RL Gang video, narrated by award-winning actress and mother Uma Thurman, was launched globally on March 3. In celebration of the launch, Polo Ralph Lauren is hosting an international search for one lucky child to be cast in an upcoming installment of the RL Gang. The contest, which will live on the RL Gang tab on Ralph Lauren’s Facebook page, will allow parents in the US and UK to upload a photo of their child and share that photo with friends and family, asking them to vote for their child. The winning child will be chosen from the group of children with the most votes, flown to New York and cast as a member of the RL Gang. The new storybook unveils each character’s personality through their individual sense of style by showcasing 17 new looks from the spring collection. If a customer likes a certain outfit, they can choose to view that character’s ‘virtual closet’ to shop similar looks. The interactive digital format offers ‘click to purchase’ capabilities allowing shoppers to select their favorite fashions directly from the pages and purchase instantly through RalphLauren.com/RLGang and Bloomingdales.com/RLGang. The Company will donate 15% of all proceeds from the first month of sales of the Childrenswear Spring 2011 collection on RalphLauren.com to Room to Grow—a charitable organization chosen by Uma Thurman. Room to Grow is an innovative program which provides parents raising babies in poverty with one-on-one parenting support and essential baby items throughout their children’s critical first three years of development. 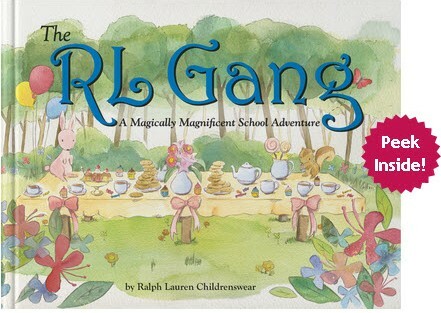 Polo Ralph Lauren and Tikatok.com, Barnes & Noble’s award-winning children’s publishing platform, produced the printed hardcover storybook version of ‘The RL Gang’ in 12 languages. The book is available for $16.95 and can be personalized as a gift. Posted in News, Social Media and tagged celebrity marketing, clothing & footwear, digital campaign, Ralph Lauren, youth marketing. Bookmark the permalink.